Under the leadership of Williamson County DA John Bradley, the Texas Forensic Science Commission has waged a masterful war of attrition in the Cameron Todd Willingham case: Stall long enough, and public interest in the internationally controversial capital punishment case — along with political liability for any missteps — will fade away. But the commission’s latest delay, while pushing the resolution of the Willingham investigation securely after the general election, comes against Bradley’s wishes and could represent a sea change on the board that until now has resisted making any broader inquiries into the state’s arson convictions. Under the leadership of Williamson County District Attorney John Bradley, the Texas Forensic Science Commission has waged a masterful war of attrition in the Cameron Todd Willingham matter: Stall long enough, and public interest in the internationally controversial capital punishment case — along with the political liability for any missteps — will fade away. But the commission’s latest delay, while pushing the resolution of the Willingham investigation securely after the general election, comes against Bradley’s wishes and could represent a sea change on the board that until now has resisted making any broader inquiries into the state’s arson convictions. “It sounds as if the panel is suggesting the investigators were abiding by the science," objected commissioner Sarah Kerrigan, who said she believed that while the fire analysts may have followed their professional guidelines, those guidelines weren’t necessarily as advanced as existing science. What existing science was at the time is significant. If the commission determines that evidence in the Willingham case was not collected using up-to-date science, it could implicate the State Fire Marshal’s Office, which has stood by investigators’ conclusions on Willingham through nine appeals and his eventual execution. It could also open the door for appeals in the cases of the estimated 750 people currently serving time on arson convictions in Texas. 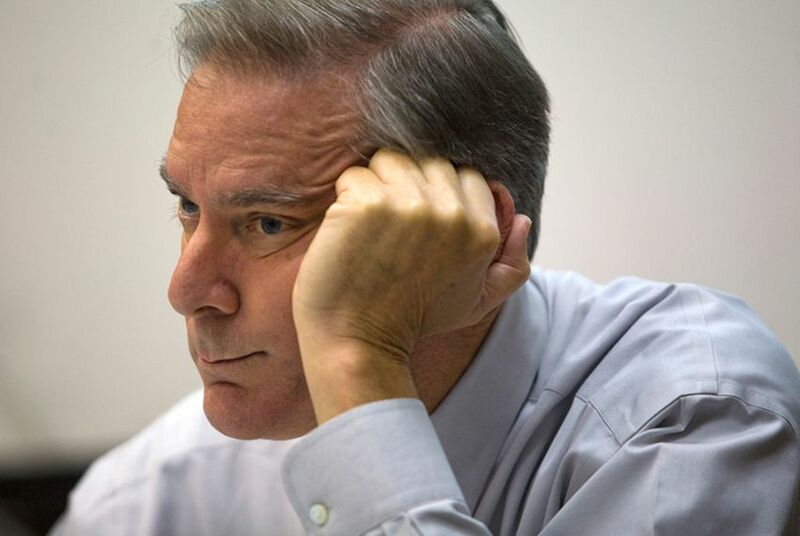 Answering questions via e-mail after the meeting, Bradley said he did not believe the commission had the legislative authority “to make global statements about alleged systemic problems” in arson cases. “Criminal defense lawyers and plaintiffs’ attorneys must be licking their chops over that issue,” he wrote. Two days before the commission was scheduled to take up the Willingham case last October, Perry abruptly replaced its chairman, Sam Bassett, an Austin criminal defense attorney, along with two other commissioners. When Bradley took Bassett’s spot, he indefinitely postponed the board’s consideration of the case and shifted the commission’s schedule from meeting every two months to every three. Perry’s action kept the board from reaching a potentially damaging conclusion in the case during a competitive primary campaign. In a general election campaign that is itself competitive, the resolution of the case likewise could have been an issue. If commissioners had approved Bradley’s report at Friday's meeting, the investigation would have been wrapped up with no explosive findings before Election Day. Now it will likely drag on into the next legislative session — giving lawmakers even more opportunity to air their concerns. Willingham made it back on the agenda at an April meeting, but members only addressed it briefly to task a subcommittee, whose deliberations would be private under the Open Meetings Act, with reviewing the case. On Friday, Kerrigan, who has refused to speak to the media, revealed that the subcommittee had not met since July. At the full commission’s July meeting, Bradley questioned the basis of Beyler's report, saying it did not properly detail the professional guidelines Texas fire investigators used at the time and focused on publications and research rather than manuals or materials the investigators would have used. It's not fair "to go back in time” and apply scientific standards that weren’t used, said Bradley, adding that investigators were doing what they were “taught at the time." At his prompting, the commission agreed to solicit the opinions of two additional fire experts, whose conclusion — that “there was no uniform ‘standard of practice’” for investigators “in Texas or elsewhere” at the time of the Willingham trial — was the basis for Bradley clearing Willingham’s arson investigators of negligence in the draft report. In July, commissioners also debated a memo that Bradley sent them arguing their jurisdiction was limited to laboratories accredited by the Department of Public Safety. That would have precluded them from considering Willingham's complaint, which hinges on the allegedly faulty investigations and testimony of experts at trial, not analysis conducted in a laboratory. After sharp criticism from lawmakers and others prior to the July meeting, Bradley said his memo was intended only as a reference point for members and not to halt their review mid-stream — though, "certainly some of the issues that were raised in the memo could question whether the commission has jurisdiction over the Willingham case." Judy Willingham Cavner, left, sits with Eugenia Willingham at Friday's meeting. Willingham's stepmother, Eugenia, and two of his cousins, Patricia Willingham Cox and Judy Willingham Cavner, attended Friday’s meeting. During a lunch break, Eugenia Willingham told reporters she was encouraged that other commission members were "standing up" to Bradley. Cox said she believes her cousin was wrongfully executed and that Perry is to blame. "The governor was made aware of it. He knew those standards were wrong in 2004," she said. 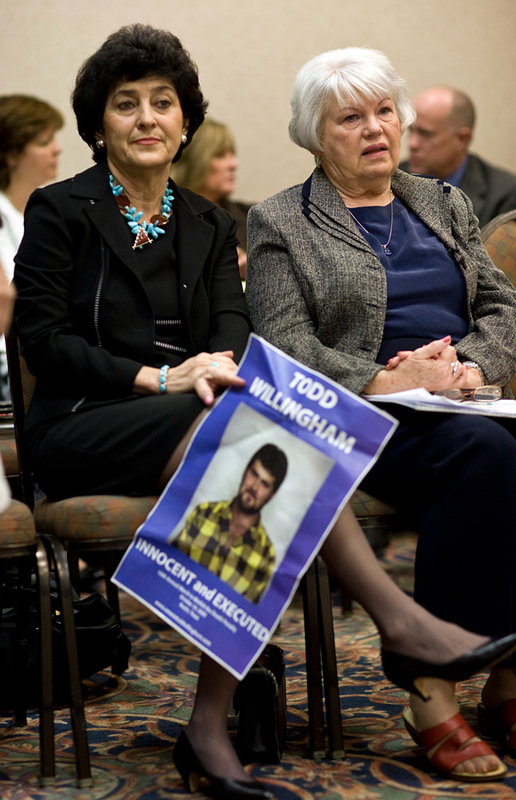 The commission will take up the Willingham case once again on Nov. 19. On Friday, Kerrigan estimated that it would likely take another meeting after that for the commission to reach a conclusion.